During this week, we’ve done some tests with stylized water and interactions, like splash particles and spume. Once it is more eye-catching we will show it off. The inspirations for it are Windwaker and the upcoming Rime. In this area and the next area, there will be some small lake zones so a proper, simple and fast water shader is in the works. We also prepared a “fake interior” for the house we’ve shown in a previous update. In the “central village hub” there will be more similar houses and as the player progresses in the game, people who used to live there will return to their abandoned homes. By then, the player will be able to knock on the doors and talk with the people inside, adding another layer to the story lore. Always knock on the house doors. 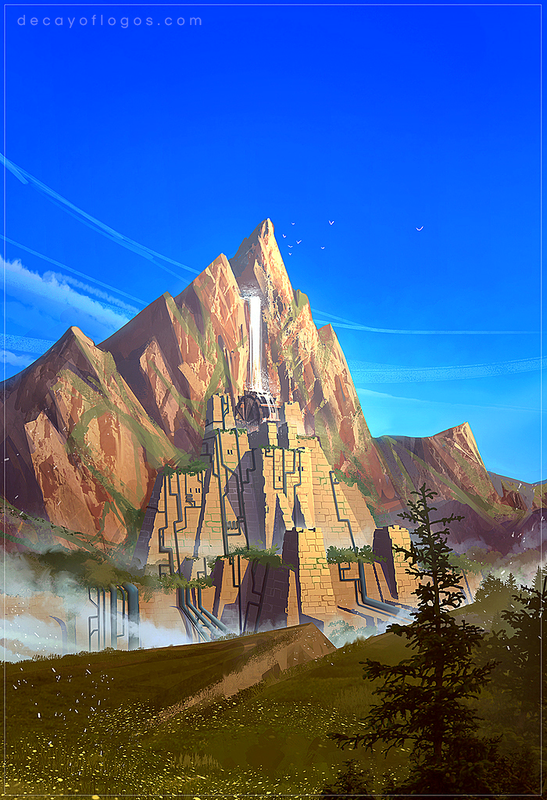 In the new area we are working on, the player can find a great Ancestor ruin, a Water Temple, that shows signs of having been repurposed… Now it functions as a steam powerhouse, but who is harnessing all this energy? This entry was posted in Animation, Concept Art, Level Design and tagged 3D, Animation, Concept, Gameplay on May 5, 2017 by Andre Constantino. This week we continued the work of replacing old animations with the new ones which add a lot more personality to the game. Walking on quicksand and the visual feedback of that action, for example, was something we needed to improve, in terms of animation and also in shader work. We’re currently working on that, but it isn’t finished yet. In the meantime, we are also doing some experiments with stylized water shaders to use in small lakes or shallow streams, for example. On a different note, the cutscene system was fine tuned, and now there is an option to skip forward those events. The new areas are developing smoothly, and although there are many assets to create, concepts like the one below help us to establish the mood we’re trying to achieve in advance. In this case, the image depicts the stage of a bloody battle. In-game soldier with full armorset. This entry was posted in Animation, Concept Art, Dev Blog, Gameplay and tagged 3D, Animation, Concept, Props on April 28, 2017 by Andre Constantino. DevBlog 50 / Our 50th blog post! Once again, we are working hard on polishing a lot of aspects of the gameplay and fixing bugs. The camera collision was improved when in small spaces, mounting and unmounting was also tuned and the transitions are much more fluid. Like we’ve shown in the previous post, our animator is replacing all the placeholder animations, and this week it was time to replace the ladder climbing animations. 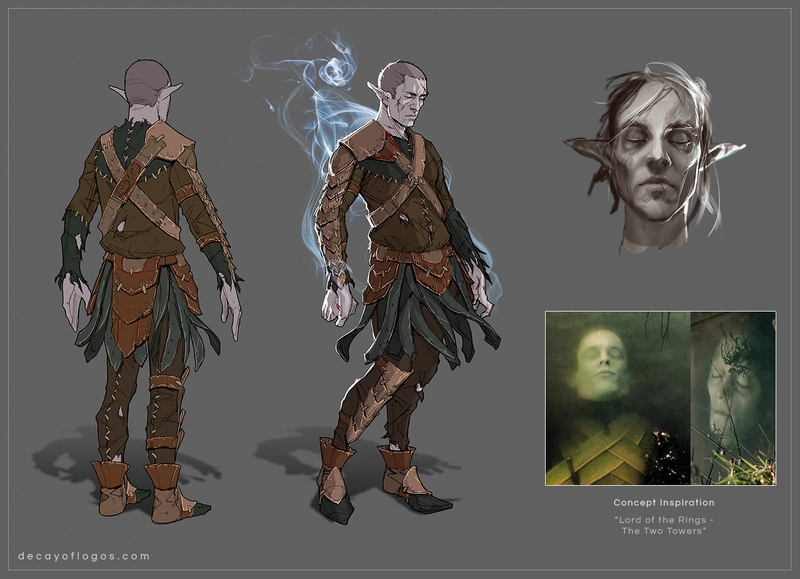 We are also working on a Lore driven collectible which we are calling “Echoes”. They basically consist of recorded memories of certain characters. As the player finds them throughout the world, these Echoes will be made available in a specific tab within the inventory. The cursed soldier model is “game-ready”, and this is the version you can see in case the enemy has no armor equipped. Like in the first chapter, we have a dynamic armor placement which makes the enemies feel different in every encounter. This time around we will also add a destroyable armor mechanic – each piece will be destroyed as the player keeps striking. Cursed soldier In-Game model (No armor). Here is the concept of the fully armored cursed soldier. This armor set can be looted from the enemies and equipped by the Girl. The full armor version of the cursed soldier. This entry was posted in Animation, Concept Art, WIP and tagged 3D, Animation, Concept on April 7, 2017 by Andre Constantino. 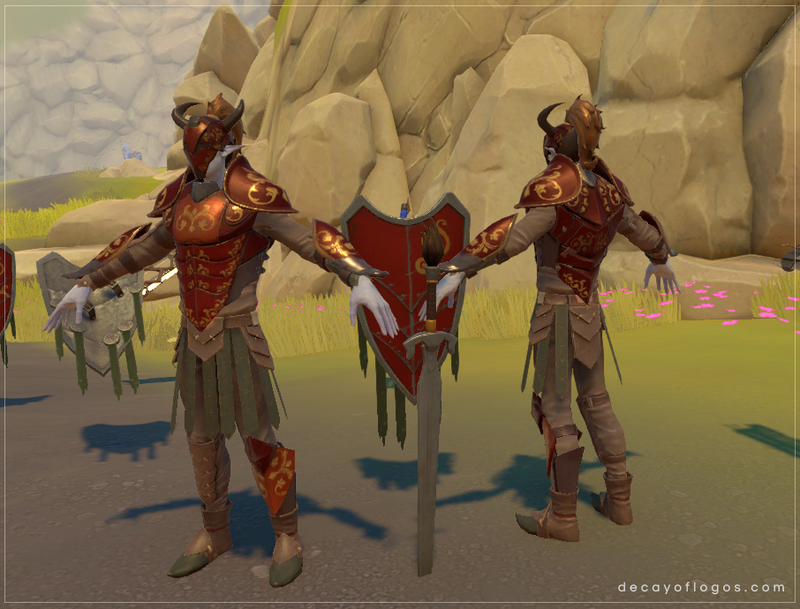 DevBlog 49 / Here comes a new challenger! This week a lot of small tweaks, balancing and gameplay polishing was done: the stamina behavior was improved (now it takes a while before the stamina is regained after it was completely drained), the parry detection is more efficient, as well as the hit detection on enemies. Changing targets when locked is now more intuitive and the player can choose easily what target they want to attack. Since it was clear that being immediately expelled from the Elk’s back while near enemies was frustrating for the players, a small change was made in the Elk’s stress behavior so that now the stress simply increases much faster instead, making the experience of riding more manageable. Direct swap items on the Elk’s inventory is now possible, so there’s no need for the poor design decision of dropping the item and then picking it up again. We are also coming up with a new foe for the Girl to fight with, a big armored Ancestor that will require careful planning in order to be brought down. This entry was posted in Animation, Concept Art, WIP and tagged 3D, Animation, Concept, Gameplay, Interactions on March 31, 2017 by Andre Constantino. Since PAX East, our art team has been working on the new chapter. Hopefully, just by looking at the first enemy concept you can tell it’s going to be very different from the previous one. A more medieval approach, with epic battles and battlefields. We already have this area blocked out for quite some time, but both the look and feel of the enemies are still in the works. Also, some level design refinement will be done. As previously mentioned, the story and mood will get darker as the adventure progresses, and the upcoming environments will reflect that change. Cursed soldier – Under-armor concept. We are working hard polishing some aspects pointed out by some players during PAX (thank you for playing and giving us honest feedback!). A lot has been done in combat fine-tuning and camera behavior. Parries now work much better and are fun to use, and defending with shields now works properly, taking into consideration the direction of the attack (this applies to the player and the enemies alike). We also added some more visual feedback when an attack lands on bigger enemies (for example, if you hit their legs, they react to it subtly by twitching). Like we’ve mentioned in previous updates, every time the player gets killed in the game, the Girl will awaken from a “nightmare” in the last checkpoint. That specific animation has already been implemented, as you can see below. Waking up from a nightmare. 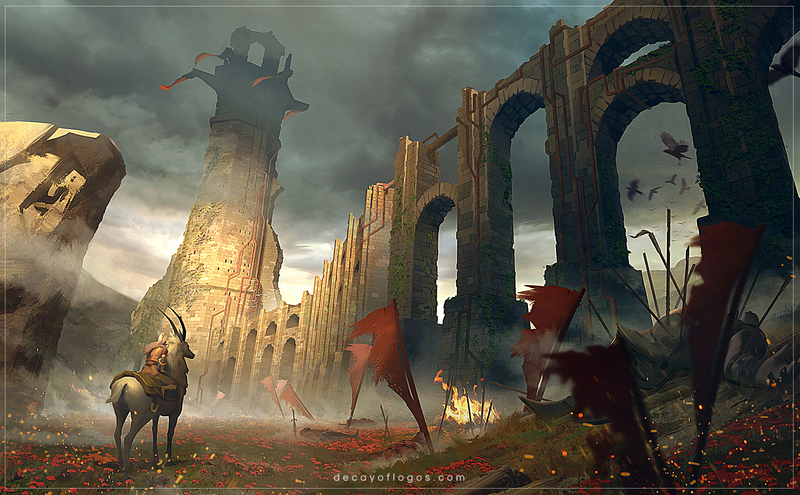 This entry was posted in Animation, Concept Art, Level Design, WIP and tagged Animation, Concept, Interactions, WIP on March 24, 2017 by Andre Constantino. We’ve been having a very busy week – preparing everything for PAX, making posters, testing, bug fixing and adding new improved material. Final look of the current buildings. Mostly it has been all about polishing what we’ve got. Small additions like flag vertex animation and candles’ behavior, or the placement of simple props laid out strategically allow us to enhance the mood and fine tune the visual storytelling. Cool illumination effects with particles. This is a small devblog post, there are way too many last minute things to do right now! The flag says it all. Wish us luck! 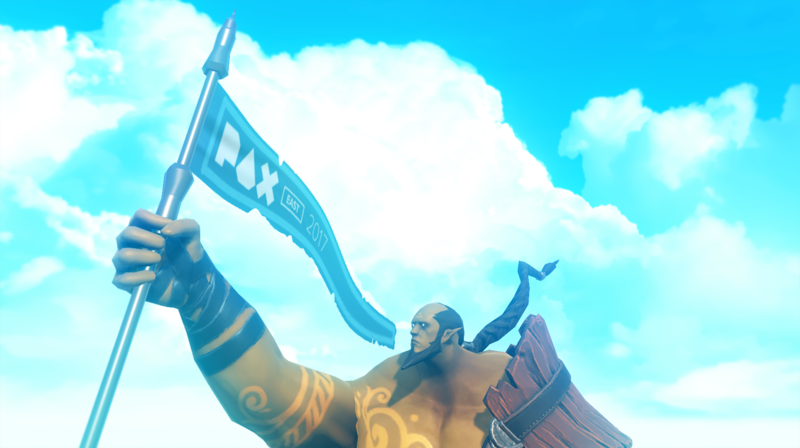 Next week we’ll write about our experience at PAX. This entry was posted in Animation, Concept Art and tagged 3D, Props, Showcase on March 3, 2017 by Andre Constantino. The Amplify Creations’ team hopes everyone had a blast during the winter break! This week we are back at full power, picking up where we left off. 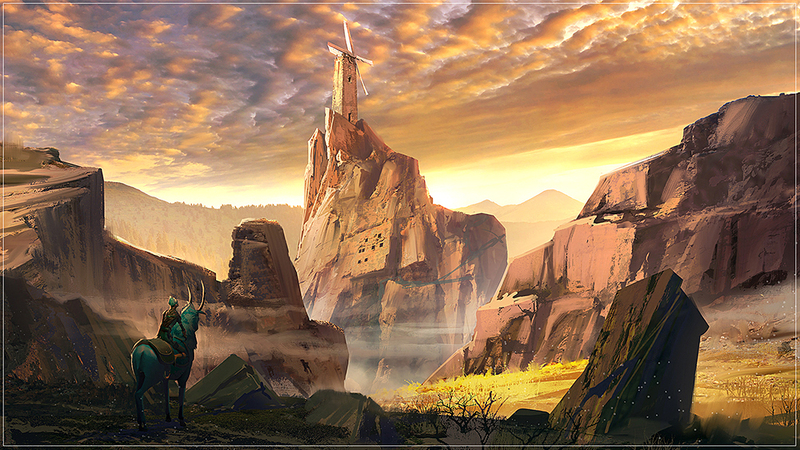 The “Rift Windmills” area is shaping up, and currently André is working on the tutorial/intro scene, where the player is introduced to a small background of the story and the first meeting between the Girl and the Elk. Like we have mentioned before, the game will feature more visual storytelling rather than an exposition narrative, so expect this tutorial/intro to have some small cutscenes but also gameplay. Rocky shapes sketch for the “Rift Windmills” area. The Kid is currently being animated, and we really want his carefree attitude to come through. This is a simple animation test to show of the cloth dynamics. Next week we will be working on the final chapter boss battle and event. This entry was posted in Animation, Concept Art, Dev Blog, Gameplay and tagged 3D, Animation, Concept on January 6, 2017 by Andre Constantino. 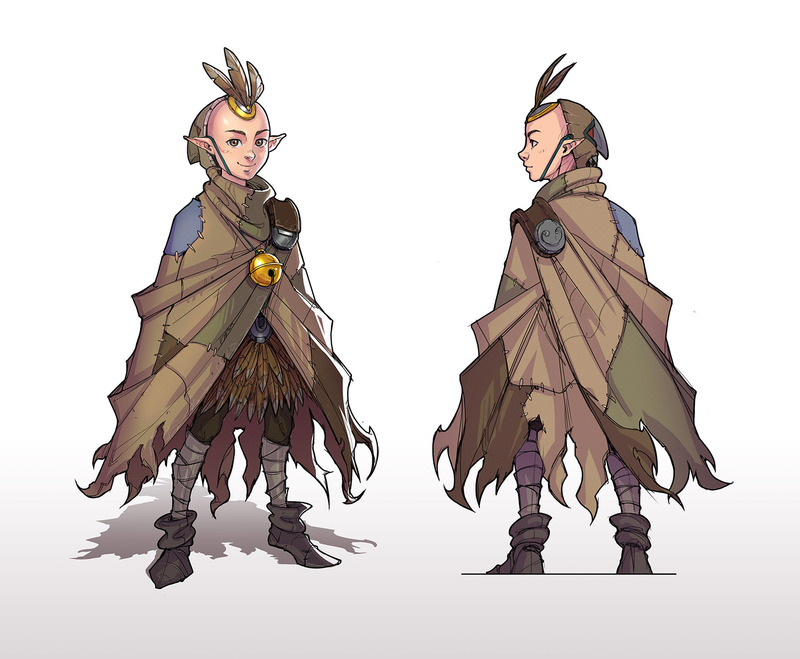 Remember the concept art for the Kid we have shown a few posts ago? We have finally wrapped up the model and textures for that character, and he is ready to be brought to life by our animator! In-game model of the Kid. 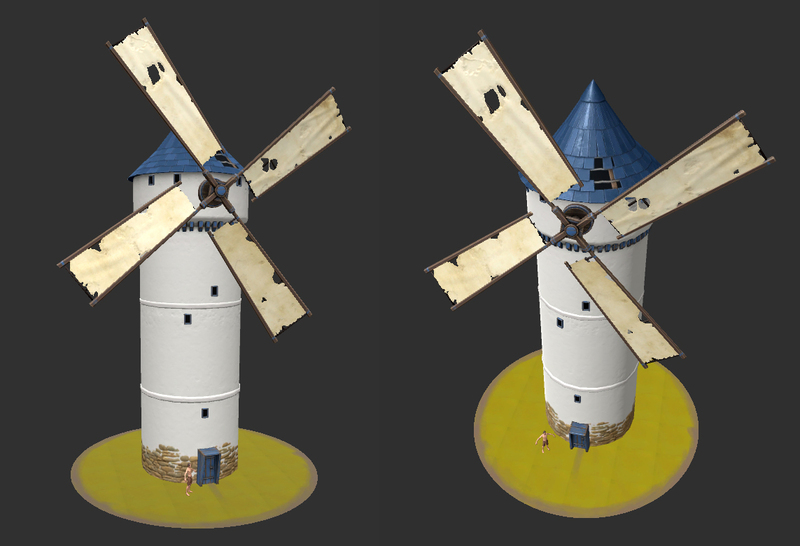 On the environment art side of things, we have started to work on a new zone of the game, which is a canyon-esque area with lots of windmills. Here is a mood and shape concept piece that is meant to guide us while we produce and put together all the various new elements that will compose the scene. 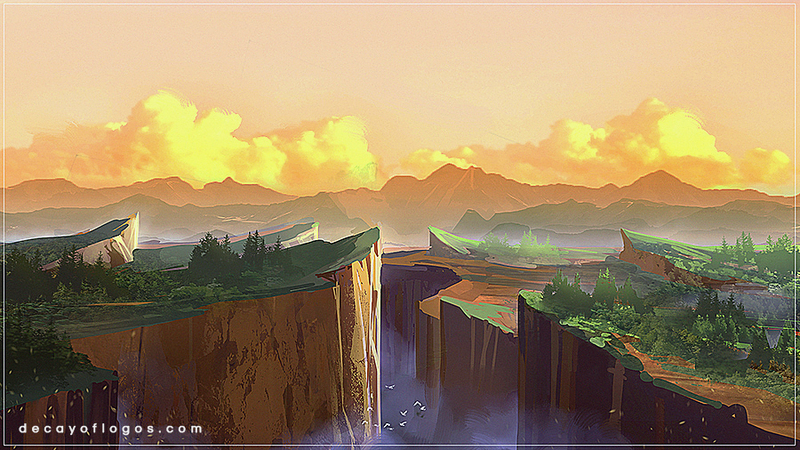 Concept art for the new canyon area. 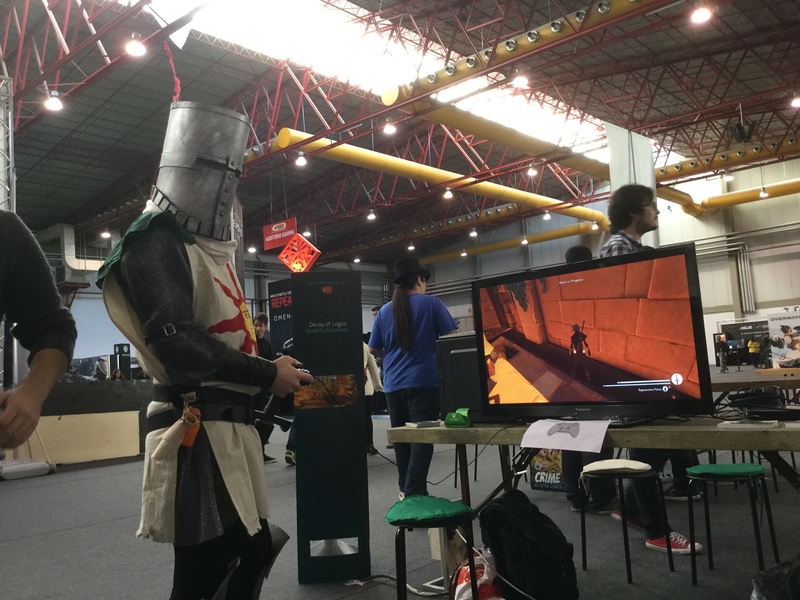 Comic Con Portugal was a blast! 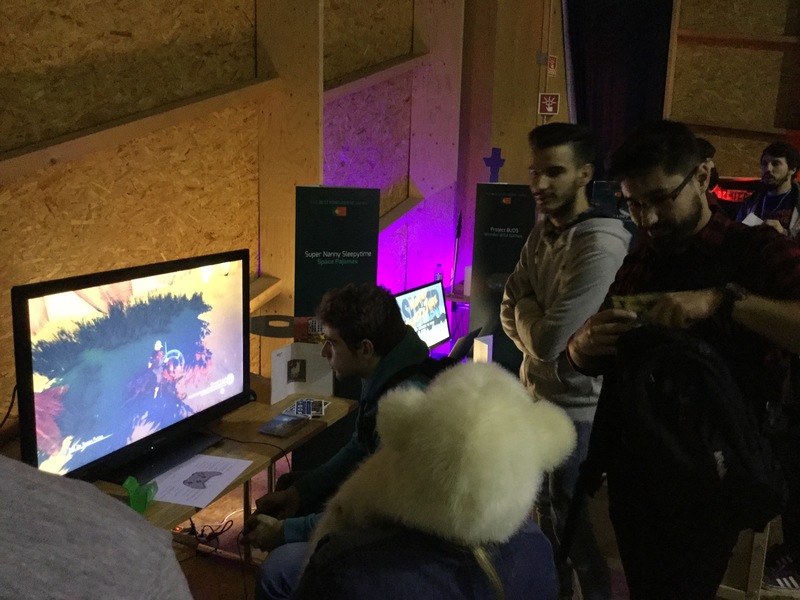 Lots of feedback and people testing and enjoying the game. We will definitely be back next year. For those who did not get a chance to play, be sure to keep an eye out for future updates. To everyone who got to play our game, thank you! 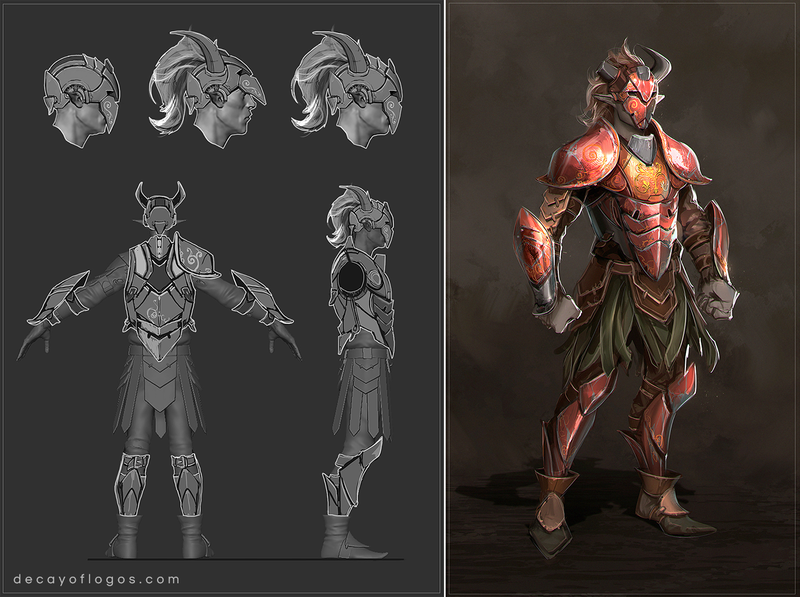 This entry was posted in Concept Art, Dev Blog, WIP and tagged 3D, Concept, Interactions, Showcase, WIP on December 16, 2016 by Andre Constantino. Last weekend we went to Lisboa Games Week – so we got a ton of feedback and a lot of play testing was done. 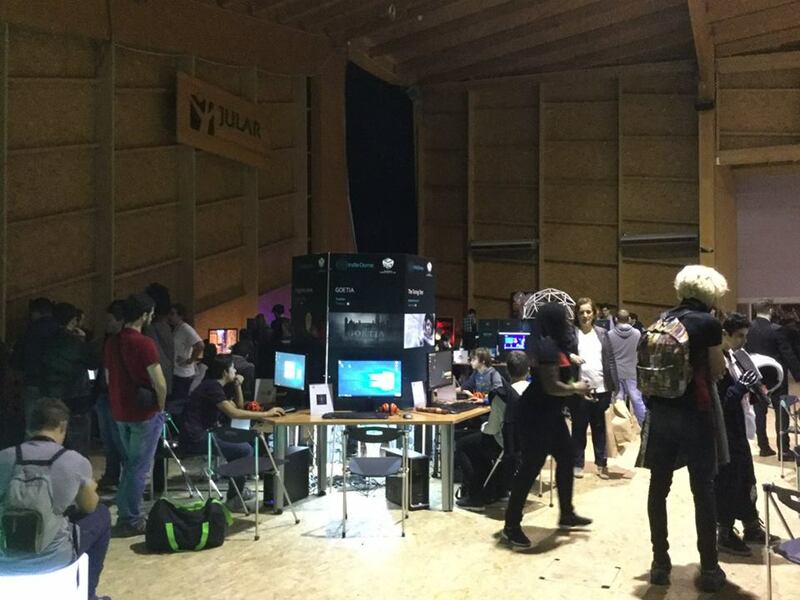 It was also great to see people from 10 years old to +30 playing and enjoying our game. We are very grateful that IndieDome selected us for showcasing at LGW (IndieDome was responsible for bringing national and international developers). 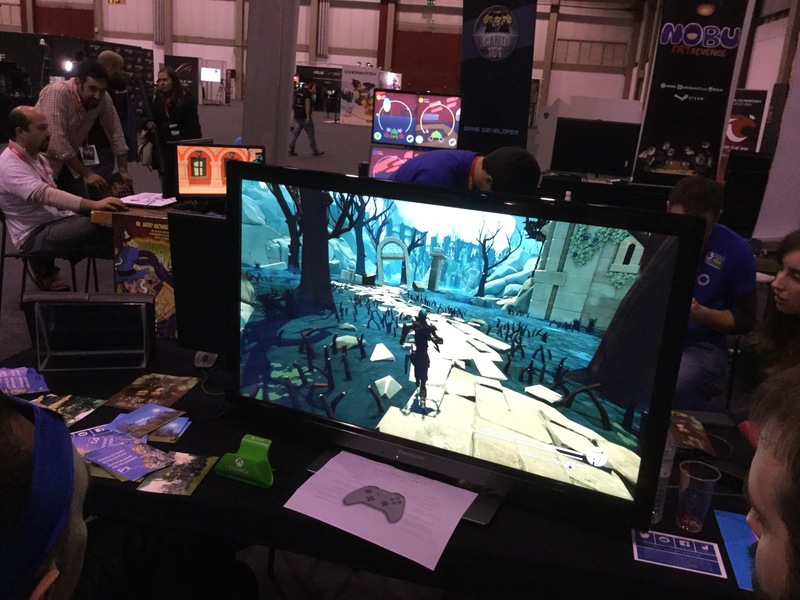 IndieDome at Lisbon Games Week. 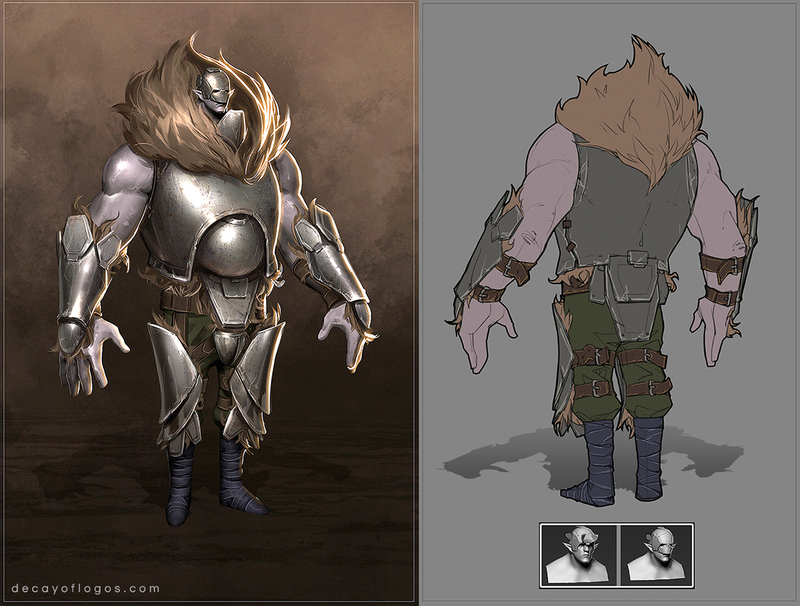 So this week we were working hard at bug fixing, as well as updating or tweaking some of the art. 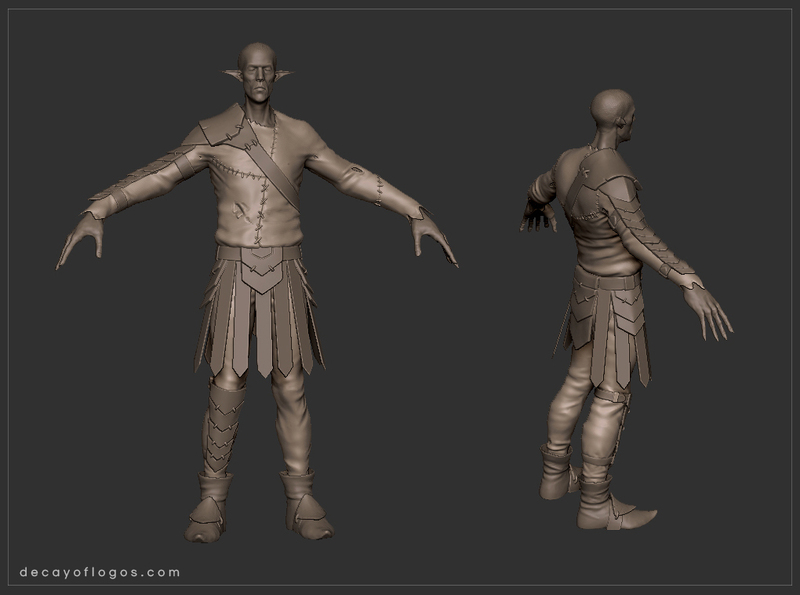 Additionally, we have just started working on a very important new NPC, and we just wrapped up the concept for him. 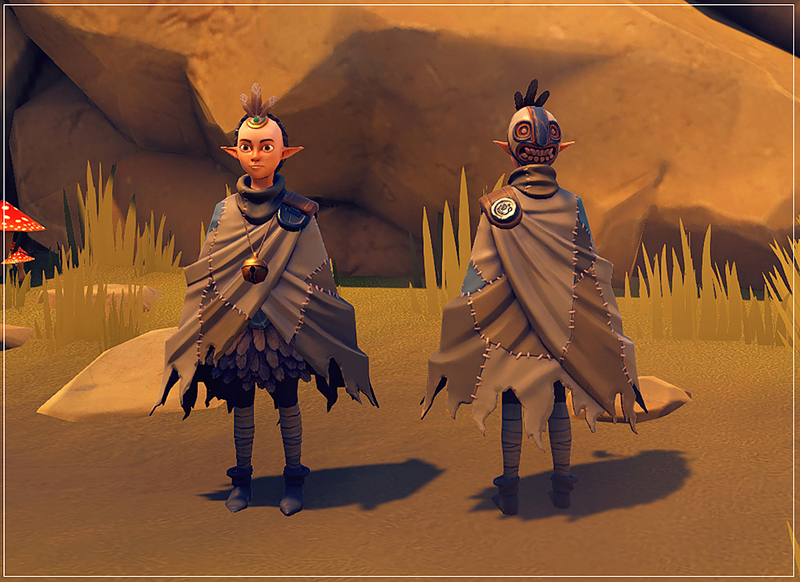 We’re currently calling him “the Kid”, and he will be a major help throughout the player’s journey, helping the Girl and the Elk get past certain obstacles, or even supplying them with items and info. This entry was posted in Concept Art, Gameplay and tagged Concept, WIP on November 25, 2016 by Andre Constantino. Once again, the team is working hard preparing a build for showcasing at Lisbon Games Week. Almost everything is ready, and we are finishing some small details as well as play testing a lot. Some additional features were added like an option to auto draw weapon when the player is near a threat. These showcase events are great for defining the default options of the game. We also introduced last week some new enemies like the half transformed villager and a swamp slug. The latter is still in the making, but we can show you guys the concept. We are working on some new move sets of the Lumberjack Brother. There are still some balancing issues, but the feeling is there. We added physics to the pony tail. The swamp area is complete (for now, we will add more stuff later). Time for some light baking, and small color grading tweaks. This entry was posted in Animation, Concept Art, Gameplay and tagged 3D, Animation, Concept on November 11, 2016 by Andre Constantino.